The muscles in the posterior compartment of the forearm are commonly known as the extensor muscles. 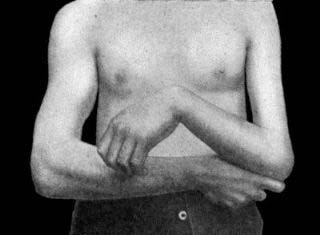 The general function of these muscles is to produce extension at the wrist and fingers. They are all innervated by the radial nerve. Anatomically, the muscles in this compartment can be divided into two layers; deep and superficial. These two layers are separated by a layer of fascia. In this article, we shall look at the attachments, actions and clinical relevance of the muscles in the posterior compartment of the forearm. The superficial layer of the posterior forearm contains seven muscles. Four of these muscles – extensor carpi radialis brevis, extensor digitorum, extensor carpi ulnaris and extensor digiti minimi share a common tendinous origin at the lateral epicondyle. The brachioradialis is a paradoxical muscle. Its origin and innervation are characteristic of an extensor muscle, but it is actually a flexor at the elbow. The muscle is most visible when the forearm is half pronated, and flexing at the elbow against resistance. In the distal forearm, the radial artery and nerve are sandwiched between the brachioradialis and the deep flexor muscles. Attachments: Originates from the proximal aspect of the lateral supracondylar ridge of humerus, and attaches to the distal end of the radius, just before the radial styloid process. Actions: Flexes at the elbow. Fig 1.0 – The muscles in the superficial layer of the posterior forearm. The extensor carpi radialis muscles are situated on the lateral aspect of the posterior forearm. Due to their position, they are able to produce abduction as well as extension at the wrist. Attachments: The ECRL originates from the supracondylar ridge, while the ECRB originates from the lateral epicondyle. Their tendons attach to metacarpal bones II and III. Actions: Extends and abducts the wrist. The extensor digitorum is the main extensor of the fingers. To test the function of the muscle, the forearm is pronated, and the fingers extended against resistance. Attachments: Originates from the lateral epicondyle. The tendon continues into in the distal part of the forearm, where it splits into four, and inserts into the extensor hood of each finger. Actions: Extends medial four fingers at the MCP and IP joints. Innervation: Radial nerve (deep branch). The extensor digiti minimi is thought to originate from the extensor digitorum muscle. In some people, these two muscles are fused together. Anatomically, the extensor digiti minimi lies medially to the extensor digitorum. Attachments: Originates from the lateral epicondyle of the humerus. It attaches, with the extensor digitorum tendon, into the extensor hood of the little finger. Actions: Extends the little finger, and contributes to extension at the wrist. 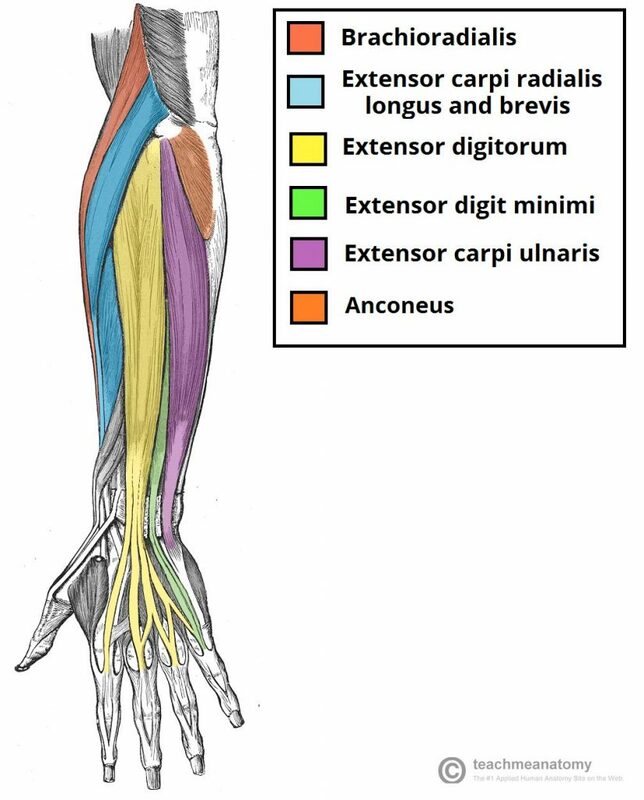 The extensor carpi ulnaris is located on the medial aspect of the posterior forearm. Due to its position, it is able to produce adduction as well as extension at the wrist. Attachments: Originates from the lateral epicondyle of the humerus, and attaches to the base of metacarpal V.
Actions: Extension and adduction of wrist. The anconeus is situated medially and superiorly in the extensor compartment of the forearm. It is blended with the fibres of the triceps brachii, and the two muscles can be indistinguishable. Attachments: Originates from the lateral epicondyle, and attaches to the posterior and lateral part of the olecranon. Actions: Extends and stablises the elbow joint. Abducts the ulna during pronation of the forearm. Fig 1.1 – Cross section of the muscles of the distal forearm. Some extensor muscles, such as the anconeus, are not visible as they are situated proximally in the forearm. Lateral epicondylitis (or tennis elbow) refers to inflammation of the periosteum of the lateral epicondyle. The peak age of onset is 40-50 years old. It is caused by repeated use of the superficial extensor muscles, which strains their common tendinous attachment to the lateral epicondyle. There are five muscles in the deep compartment of the posterior forearm – the supinator, abductor pollicis longus, extensor pollicis brevis, extensor pollicis longus and extensor indicis. With the exception of the supinator, these muscles act on the thumb and the index finger. Fig 1.2 – Muscles in the deep layer of the posterior forearm. The supinator lies in the floor of the cubital fossa. It has two heads, which the deep branch of the radial nerve passes between. Attachments: It has two heads of origin. One originates from the lateral epicondyle of the humerus, the other from the posterior surface of the ulna. They insert together into the posterior surface of the radius. The abductor pollicis longus is situated immediately distal to the supinator muscle. In the hand, its tendon contributes to the lateral border of the anatomical snuffbox. Attachments: Originates from the interosseous membrane and the adjacent posterior surfaces of the radius and ulna. It attaches to the lateral side of the base of metacarpal I.
Innervation: Radial nerve (posterior interosseous branch). 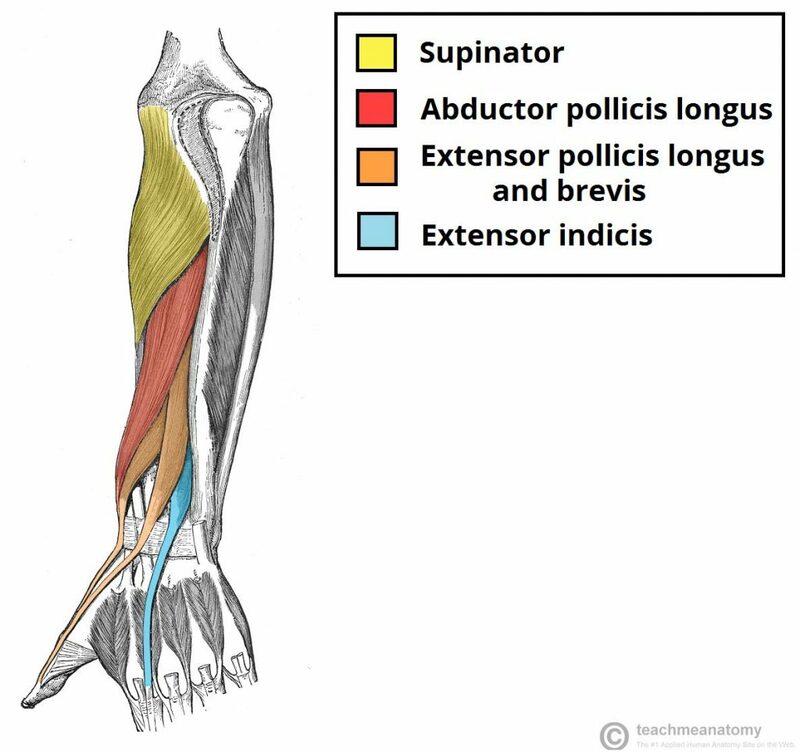 The extensor pollicis brevis can be found medially and deep to the abductor pollicis longus. In the hand, its tendon contributes to the lateral border of the anatomical snuffbox. Attachments: Originates from the posterior surface of the radius and interosseous membrane. It attaches to the base of the proximal phalanx of the thumb. Actions: Extends at the metacarpophalangeal and carpometacarpal joints of the thumb. The extensor pollicis longus muscle has a larger muscle belly than the EPB. Its tendon travels medially to the dorsal tubercle at the wrist, using the tubercle as a ‘pulley’ to increase the force exerted. The tendon of the extensor pollicis longus forms the medial border of the anatomical snuffbox in the hand. Attachments: Originates from the posterior surface of the ulna and interosseous membrane. It attaches to the distal phalanx of the thumb. Actions: Extends all joints of the thumb: carpometacarpal, metacarpophalangeal and interphalangeal. This muscle allows the index finger to be independent of the other fingers during extension. Attachments: Originates from the posterior surface of the ulna and interosseous membrane, distal to the extensor pollicis longus. Attaches to the extensor hood of the index finger. Actions: Extends the index finger. Fig 1.3 – Wristdrop of the left forearm, as a result of radial nerve palsy. Wrist drop is a sign of radial nerve injury that has occurred proximal to the elbow. Axilla – injured via humeral dislocations or fractures of the proximal humerus. Radial groove of the humerus – injured via a humeral shaft fracture. The radial nerve innervates all muscles in the extensor compartment of the forearm. In the event of a radial nerve lesion, these muscles are paralysed. The muscles that flex the wrist are innervated by the median nerve, and thus are unaffected. The tone of the flexor muscles produces unopposed flexion at the wrist joint – wrist drop. Which nerve is responsible for innervating the muscles in the posterior forearm? What is the common site of origin for posterior forearm muscles?